Not so long ago something like the Sony Xperia Touch would have seemed like the stuff of science fiction. It’s a somewhat portable (though far from pocket-sized) projector which can turn any flat surface into a 23-inch interactive Android screen. 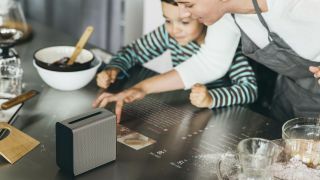 If that sounds like something you’d want you’re in luck, because you can now buy the Xperia Touch in the UK, but only if you’ve got £1,300 (around $1,660/AU$2,185) to spare. It’s listed as coming soon in the US and there’s no word on if or when the Xperia Touch will land in Australia, but you shouldn’t be too disappointed if it doesn’t launch in your region. In our hands on review we found it impressively responsive, allowing you to use any flat surface as a makeshift tablet, but found the unit itself too big, the display too dark and struggled to see why it would be preferable to a tablet for most people – and that was back when we assumed the price would be a whole lot lower. Still, this is a fairly new idea, and the first in what might well be a new wave of projectors, so over time it’s likely that the price will come down, and that future models will come in a more compact package. So unless you’re desperate to turn your dining room table into a tablet you might want to hold off for now and see what the future brings. After a more conventional tablet? These are the best.